The A2 Motorbike licence is designed for people between 19 - 23 years old. It enables you to ride a medium size bike at least 395cc (33bhp - 46.6 bhp). We use Yamaha MT-07's and Suzuki GS 500's; so imagine at 19 you could be training on a 500 or 700cc! We also have lowered MT-07's, so no excuse for those of you 'not so tall'! The DAS Motorcycle licence is the full unrestricted motorbike licence which can be attained if you are over 24 or have held an A2 licence for 2 years. This allows you to ride any size bike at all. You will train on one of our brand new Yamaha MT-07's. And yes, we’ve taught people in their 70’s, so don’t rule yourself out, after all Matts a grandad bless him! We have lowered DAS bikes too, so don't be put off if you're 'vertically challenged, you may still be able to do DAS'!!! Although we offer complete package deals we realise not everyone is the same, so we also offer all training tailored to suit you personally, the best option is to take advantage of a Free Assessment at MTS Sussex, that way we can see how much training you really need before you start; no point wasting time & money on lessons you don’t need, or putting pressure on yourself trying to learn at someone elses pace. For more information see our Full Motorcycle Licence FAQs. We guarantee a maximum of 2-1 student / instructor ratio throughout your training, from CBT road ride to test day. This means each student receives the individual time & training they need without exception. Unlike the CBT, there is no set syllabus for A2 or DAS as such. At MTS Sussex we will instruct you to a safe and competent level of riding which will also cover everything you will need for the big day, and hopefully your riding career thereafter! To find out more about the current A2 & DAS motorcycle licence and test requirements see our Guide to the A2/DAS Motorcycle Licence. Your A2 motorcycle training will start with a conversion from a smaller bike such as 125cc if that’s what you’re used to or have just completed your CBT, up to one of our Yamaha MT-07's or Suzuki GS's . It’s not as comprehensive as it sounds, but it’s important that you’re aware of the differences between the bikes and how your riding will be affected by this. Generally people that ride bigger bikes are surprised how easy it is once they’ve got used to it. Then a good ride around on the A2 bike gives you the chance to do just that, and once you’re used to it, the fun begins! Typically DAS motorcycle training will consist of a conversion from a smaller bike to one of our new fleet; the Yamaha MT-07's. As with the A2 conversion, it’s not as comprehensive as it sounds, but it’s important that you’re aware of the differences between the bikes and how your riding will be affected by this. Then a good ride around on the big bike really gets you in the swing of things. At MTS Sussex we ensure you are well prepared to pass the practical motorcycle tests before we recommend you take them. 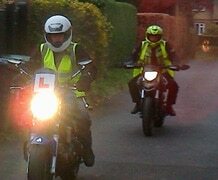 Our training locations in Burgess Hill and East Grinstead are in quieter locations than a lot of other riding schools, so we can introduce you gradually to riding on faster busier roads. We also recommend that you split your tests up so you don't stand to forfeit Mod2 if you're not successful with mod1-this way the pressure is off and the pass rate is a lot higher. There is no extra charge for splitting the tests, but if you would rather have both booked on the same day we can also do that. Module 1 preparation will also be part of your training, so by the time you go to test you should be comfortable with each maneuver. There are safety techniques which apply to each maneuver, these will be well practiced prior to your test day; you never know, you may even enjoy your Module 1 test! At MTS you will cover as much everyday riding as possible from our centre in Burgess Hill West Sussex - averaging 60 miles a day! This will include quiet and built up areas, town centres, junctions, roundabouts, country roads, and dual carriageways. You will be taught effective use of gears, observations, signalling, positioning and much more, preparing you for your Module 2 test. MTS Sussex is a family run business that prides ourselves in offering both excellent motorcycle training and tremendous value for money. The price for a 3 day courses including tests is just £495! Our 4 day A2 & DAS package is only £595! This includes your CBT, the remaining time is test training and the tests themselves. Once again all inclusive of bike (and protective equipment if needed), CBT certificate and test fees. You will need to complete your theory test prior to your training, and apart from during the CBT, these prices do not include fuel which is the responsibility of the student. Our 5 day A2 & DAS package during is just £695! Once again, this includes your CBT, the rest as above. Our tailored A2 & DAS training includes use of jacket, gloves & helmet if requires, as well as bike use. However the prices do not include fuel which is the responsibility of the student. Just give us a call to chat through your options or maybe to arrange a Free Assessment. Please note: For your safety you must be able to communicate in English & have a basic knowledge of the highway code to complete any training with MTS. You must also wear appropriate clothing and footwear and without this you will be sent away and forfeit your training and fees. The list is non exhaustive but includes a minimum of jeans without holes, rips, tears, not shorts, skirts or track suits, and you must have boots (non steel toe cap) for all training beyond CBT, and sturdy footwear (ideally boots non steel toe cap) not sandals, Crocs, deck shoes or similar for CBT. To book your place on a DAS Course with MTS Sussex call us on 01444 246714, 01293 850802 or 01342 890006, email us at [email protected] or use the on-line contact form.